As a matter of fact, numbers of new 4K Phones and Tablets sticking 4K playing/recording are available on market. If you are looking for the top-rated 4K Phones and 4K Tablets, you are in the right place. With no further ado, just check out our top picks of 4K Phones and Tablets below, whether you are hunting for a phablet-sized phone or a conventionally-sized pocket sidekick. The 9.7-inch Apple iPad Pro is the best tablet yet. We love the sleek design and stunning True Tone display, which makes the most of the 1 million tablet-specific apps available in the iOS App Store. Not only can this slate’s 12-megapixel camera shoot in 4K, the A9X processor inside can also edit multiple 4K streams without a hiccup. Plus, this more portable Pro tablet lasts a remarkable 10 hours and 53 minutes on a charge, and it supports the $99 Apple Pencil. The iPad Pro is a pretty impressive big-screen tablet on its own, but adding the $99 Apple Pencil will really help you get the most out of the 12.9-inch display. The Pencil offers a silky-smooth and lag-free experience in drawing and sketching. You can easily edit 4K video on the go, thanks to the powerful A9X processor inside the tablet. Add in 10 hours of battery life, and you have a lot of reasons to invest in this premium slate. For better performance delivery, a faster A9X processor and upgraded 4G RAM will be equipped to this third-generation of iPad Air. Another rumor also suggests a 4K screen with a resolution of 2334 x 3112 for iPad Air 3. Thankfully, by means of an app, you can push the video recording resolution of your iPhone 6 or iPhone 6 Plus way beyond its specified 1080p standard towards something pretty close to 4K. While, with the launch of Apple’s iPhone 6s and 6s Plus, users now have the option to shoot up 12-megapixel photos and 4K video at 30 fps. In addition, if you’re into shooting video, then the iPhone SE’s upgrade to 4K is a compelling one. Not only can the iPhone SE shoot 4K video, but it can also edit multiple streams of 4K video in iMovie. Even if you don’t own a 4K monitor or television, the benefits of such high resolution are multi-faceted. For instance, you can use 4K videos to perform artificial pans and zooms in your editing software of choice, while still maintaining enough resolution for 1080p output. Other 4K phones/tablets from Android are 4K camera phones which can record 4K videos with the 4K camera. First let’s look at the current 4K phones on market from hot brands. How many pixels can you cram into a notebook? Toshiba is testing the limits with the Satellite Radius 12, a 12-inch convertible with an optional 4K touch screen. But there’s more to it than pixel count: This display, tailored to highly mobile photographers and video editors, is more colorful than any other display this size. Plus, this 3-pound hybrid comes with a 6th-gen Intel Core i7 processor, 8GB of RAM and a 256GB solid-state drive, all for $1,299. Surface Hub is an 84-inch tablet giant being packed with a 4K screen resolution, sensors, speakers, WiFi, NFC, microphones, cameras, Wireless Projection and more. And Microsoft is reportedly gearing up to unveil its Surface Book 2 soon, rocking a high-resolution 4K display and a USB Type-C port. All the 4K phones/tablets above can better handle various tasks, especially for high resolution contents playback. But can all the above 4K phones/tablets hold or play 4K videos? Can they play 4K video/movies with all quality intact and no stuttering and crashing error? The answer is, disappointedly, that it should, but not truly can. In the first place, 4K video takes way much space in addition to the high requirement on resolution. It would take much time to download a 4K video from YouTube or other video websites and not be able to be played smoothly on iPhone 6S/6S Plus/6/6 Plus, iPad Pro, iPad Air 3 or Android devices and we have image stabilization to concern. Furthermore, with those microscopic pixels you wouldn’t be able to tell 4K apart from 1080p screen due to the pixel density. But optimistically at present, 4K videos can be played on 4K Phones/Tablets once being compressed and converted to iPhone 6S/6S Plus/6/6 Plus/iPad Pro/iPad Air 3/Android supported video formats, in 1080p, at 4:3 or 16:9. After shrinking, the 4K video will have better 1080p or the ability to crop or digitally zoom into a 1080p section. To solve the troublesome media compatibility and video size issues, all you need is a 4K video converter/compressor. This tutorial will show you how to transcode 4K to iPad Air 2 with maximum high quality reserved such that you can watch 4K movies on iPad Air 2 with original quality on the go. This tutorial will show you Xperia Z5 Premium supported video/audio formats and how to convert video to Xperia Z5 Premium. Yearn for converting 4K video to Surface Hub for watching while moving around? Here present you how to convert 4K video to Surface Hub with greatest ease. The tutorial focuses on the solution to convert 4K video to iPhone SE readable format in a snap so that you can play 4K FLV MOV M2TS MP4 AVI MKV videos on iPhone SE limitlessly with optimal quality. Smartphones and tablets, new or old, are devoid of BD/DVD players, leading to the inability to play Blu-ray/DVD movies on 4K phones and tablets thereon. However, many Blu-ray/DVD rippers do not support the latest mobile devices or cannot rip copy-protected Blu-ray/DVD discs. Expect to watch DVD movies on Surface Hub with 4K solution on the move? This tutorial will show you how to rip DVD to Surface Hub Windows 10 tablet so that you can enjoy DVD on Surface Hub on the go. This article show you how to rip copy protected Blu-ray to Surface Huab playable format to help you play DVD on this gadget on the go. Don’t know how to make Blu-rays playable on iPad Air 2? This article will show you a 4-step solution to convert Blu-ray to iPad Air 2 with top quality. Wanna the best ISO ripper that works flawlessly for Surface Hub? Choose an ISO ripper tool designed to rip DVD/Blu-ray ISO to Surface Hub compliant format. Learn how to rip Blu-ray/DVD to iPad Pro compatible videos with an easy and quick way, includes 9.7" and 12.9" iPad Pro. If you have lots of ISO files and an iPad Pro, chances are you want to play ISO on iPad Pro. Here is a detailed guide you can follow step by step. This DVD to iPad Air 3 guide will tell you how to rip DVD movie to iPad Air 3 surpported format in a few clicks. This article aims to show you the easiest solution to rip DVD to iPhone 6/6 Plus, so that you can watch your favorite DVD movies on iPhone 6/6 Plus freely on the go. To watch DVD on this iPhone, you need to rip DVD to iPhone 6S friendly format first. Fail to import DVD to iPhone 6 Plus? Don’t worry any more. Find this clue in this article. Here is the best solution to rip DVD to Xperia Z4 tablet. See how to rip protected Blu-ray to iPhone SE on Mac with Pavtube BDMagic for Mac. This article provides a easy and quick solution to play Blu-ray movies on Surface Book 2 with high quality. 4K Mobile devices have limited video format supported and cannot play all videos on 4K phones/tablets due to the format issue. Some video converters take a long time to convert videos but output videos with quality loss. iPhone 6S supports relatively few video formats, only MOV, MP4, M4V video format. If fact, it is very easy to put video to iPhone 6S so long as you own the professional video to iPhone 6S converter. 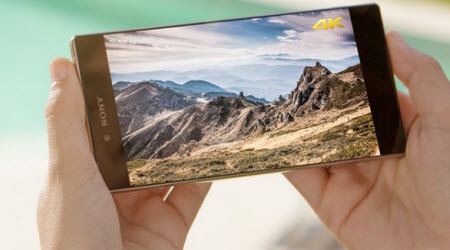 Top Sony Xperia Z4 video converter allows you to convert any video to Sony Xperia Z4, bringing you the possibilities to play MKV MOV FLV AVI etc. videos movies on Xperia Z4. The feeling of watching movies and videos with the mobile device is amazing, thanks to their stunning high-resolution screens. But the truth is you may be constantly embarrassed by the compatibility issues. What’s the video formats that can be played on iPad Air 2/Mini 3? Here you will learn the supported video format for iPad Air 2/Mini 3 and Blu-ray/DVD ripper & video converter to transfer movies and videos for watching on these gadgets. Unsure about How you can save and watch Videos Offline on Your iPhone 7/SE? Read on iPhone 7/SE supported formats for more details. Are you struggling to play videos Surface tablets freely? To convert videos to Surface playable format is an easy solution for users to play any video files like M2TS, MTS, AVI, FLV, MOV etc on Surface tablets without any limit. If you want to reap the full benefits of having 4K Phones and Tablets, just scroll down and get the most trustworthy apps to enrich your Blu-ray/DVD, SD/4K video entertainment on your devices. Pavtube DVDAid/Pavtube BDMagic/Pavtube ByteCopy – Free Blu-rays/DVDs from the confines of their plastic-and-metal prison and copy & rip Blu-ray/DVD to the latest 4K mobiles regardless of BD/DVD copy protection. Pavtube Video Converter Ultimate – Transocde & convert videos (HD/4K included) for playback on 200+ mobile devices with 4K resolution in intack quality and world’s fastest speed. To remove downloaded, purchased or rented DRM-protected videos from iTunes, Amazon Instant Video, Digital Copy, Windows Media Center, Zune Marketplace, BBC iPlayer, Xbox Live Store, Limewire, uTorrent, FrostWire, etc., and convert them to all popular video/audio formats for playing on 4K phones/tablets anywhere you like without any hassle, the top DRM Converter – Pavtube ChewTune is right here waiting for you. Good news! Pavtube Studio has rolled out 2016 Mother Day’s great promotion for all its customers, just join our Facebook community,you can then enjoy up to 50% OFF discounts for our high-ranked Blu-ray/DVD/Video media conversion tool!